Sand Creek Prairie Plant Preserve lies on the edge of the Jackson Interlobate Ecoregion, an area which was positioned between three glacial lobes that formed approximately 13,000-16,000 years ago. The plant preserve is noted for the presence of the oak barrens. An oak barren community is a fire-dependent savanna community dominated by oaks. An oak barren community has between 5 and 60 percent canopy, with or without a shrub layer, and are typically found on droughty soils. Sand Creek Prairie protects and assemblage of species typically found in prairie remants, including golden Alexander, western sunflower, grey-headed coneflower, wild lupine, wild bergamot, and hairy beardtongue. Historically, the surrounding landscape was predominately oak barrens, however there appears to have been a somewhat open canopy for the diverse prairie flowers which established themselves here. Sand Creek Prairie also protects the last known extant population of Hill’s thistle in southern Michigan. Hill’s thistle is a generally short, perennial thistle with a deep, hollowed. and thickened taproot. It has soft, rigid leafy stems with woolly hairs. Sand Creek Prairie is threatened by the presence of invasive species, including glossy and common buckthorn and bush honeysuckle. 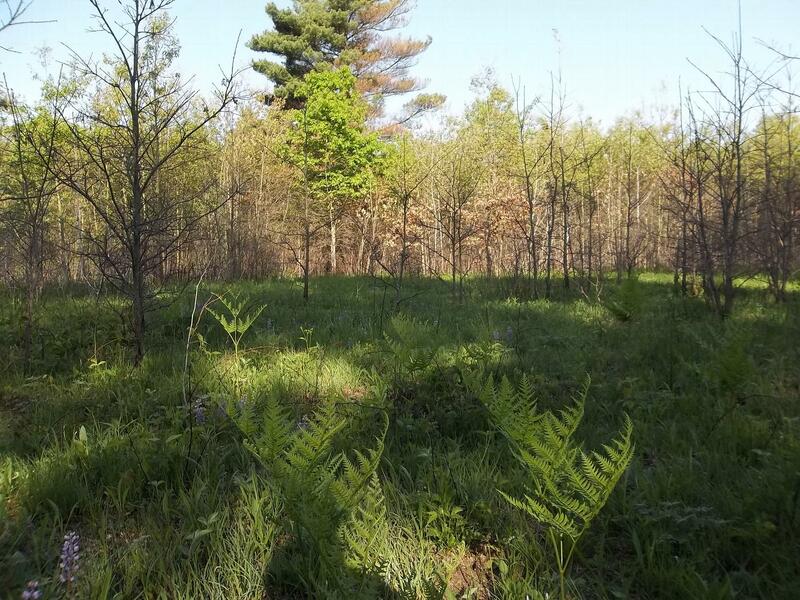 In addition, concentrations of trees and shrubs are trying to establish themselves within the interspace between oaks, turning this savanna into a forested community. MNA’s stewardship efforts at Sand Creek Prairie include controlling and removing these invasive species and encroaching woody growth. .
Fire management also plays an important role in management of the prairie’s oak barrens, and the species that live within are fire-dependent. Frequent fires maintain the oak barren’s semi-open conditions, promoting oak regeneration and diversity within the understory. Oak barrens themselves likely originated when prairie fires spread into surrounding oak forest with enough intensity to create open barrens, so repeated low-intensity fires working in concert with drought, frost, and windthrow maintain oak savanna ecosystems. Fires in oak barrens and prairie typically occurred during the spring, late summer and fall. Access to Sand Creek Prairie Plant Preserve is restricted. For more information, contact the MNA office at (866) 223-2231.